Note: This is the 1st full appearance and origin of Venom (Eddie Brock). Condition: This book has been graded by CBCS an unrestored 9.2 NM. There are no exceptions to this rule so please do not ask. Please keep in mind that grading is a matter of opinion and not an exact science. As you can see from my feedback the vast majority of buyers are happy with my grading. We strive to be as accurate as possible but have found you can't please everyone and some people are just plain unreasonable. It is never our intent to "rip" anyone off. But if you don't make us aware of the problem we can't fix it. Also keep in mind that this is a Mom and Pop operation and not a large business with multiple employees. We try to answer emails as quickly as possible but sometimes we are just not around. So we will get back to you as soon as possible and appreciate your patience. 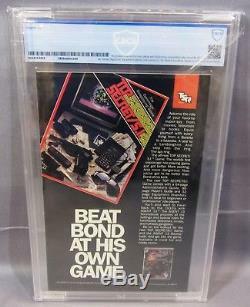 Remember, collecting should be fun. 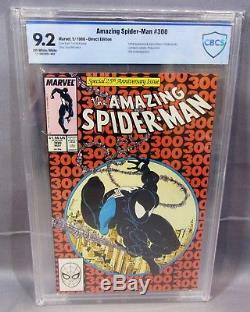 The item "THE AMAZING SPIDER-MAN #300 (Venom 1st app.) 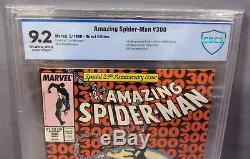 CBCS 9.2 NM- Marvel Comcs 1988 cgc" is in sale since Thursday, February 15, 2018. This item is in the category "Collectibles\Comics\Copper Age (1984-1991)\Superhero\Spider-Man". The seller is "amazing_heroes" and is located in Kirkland, Washington. This item can be shipped to United States, Canada, United Kingdom, Denmark, Romania, Slovakia, Bulgaria, Czech republic, Finland, Hungary, Latvia, Lithuania, Malta, Estonia, Australia, Greece, Portugal, Cyprus, Slovenia, Japan, China, Sweden, South Korea, Indonesia, Taiwan, South africa, Thailand, Belgium, France, Hong Kong, Ireland, Netherlands, Poland, Spain, Italy, Germany, Austria, Israel, Mexico, New Zealand, Philippines, Singapore, Switzerland, Norway, Saudi arabia, Ukraine, United arab emirates, Qatar, Kuwait, Bahrain, Croatia, Malaysia, Brazil, Chile, Colombia, Costa rica, Panama, Trinidad and tobago, Guatemala, Honduras, Jamaica.